Thursday October 19 1911 I got dinner early and Will & I took some things down home. We then went to the cemetery I had a little flower for Mother's grave. We then went back over home awhile Aunt Lib & Aunt Emma were there helping knot a [carpet? comforter?] Will took Old Jessey down to Woolfs in the morning. Friday October 20 1911 Did the regular work and in the afternoon took some things to the rummage sale and went out to Aunt Emmas awhile. It was getting cold when we came home. Read in evening. Saturday October 21 1911 I was at home sewing all day. Will to town in afternoon and I went down an hour after supper for some things. 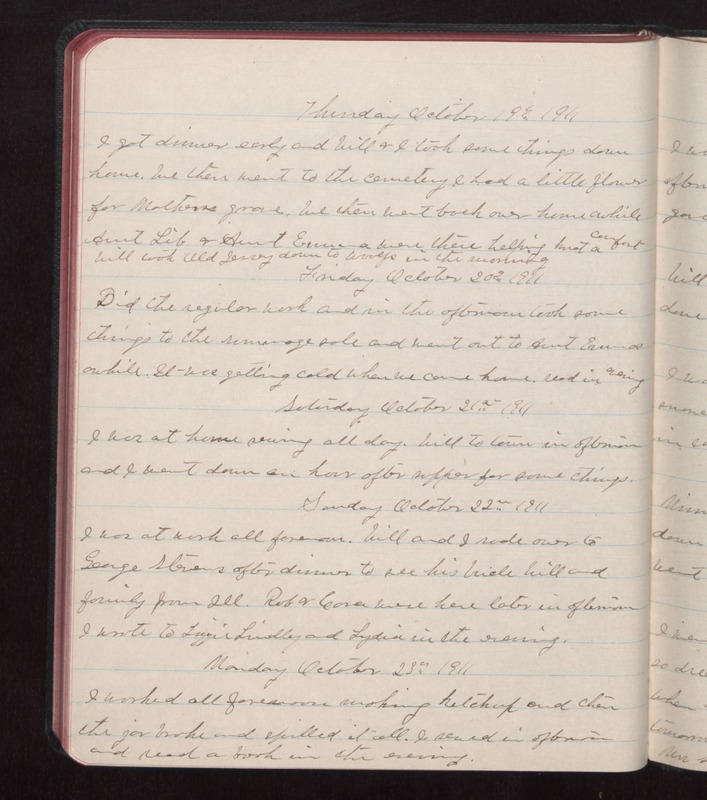 Sunday October 22 1911 I was at work all forenoon. Will and I rode over to George Stevens after dinner to see his [illegible] Will and family from Ill. Rob 7 Cora were here later in afternoon I wrote to Lizzie Lindley and Lydia in the evening. Monday October 23 1911 I worked all forenoon making ketchup and then the jar broke and spilled it all. I sewed in afternoon and read a book in the evening.